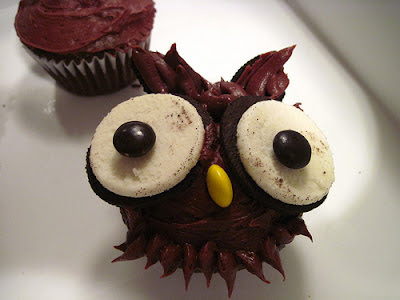 These cupcakes are so adorable and easy to make. They would make a perfect party dessert...your guests will love them! Bake the cake mix according to package instructions for cupcakes. Allow to cool completely. Once cooled, frost the cupcakes with the chocolate frosting. Separate oreos and place on either side of the cupcake to create the eyes. Place 2 brown M&M's in the center of the oreos and one yellow M&M between the oreos for the nose. With a piping bag or a fork place a small amount of frosting above the eyes for the ears and extra on the bottom of the bottom of the cupcake for his beard. I found it easy to just use the tip of a fork and pull down some frosting to create the beard. Enjoy! This is absolutely adorable using the most accessible candies! Love it!